I’m not a fan of Monday’s, actually I f#$%en hate them! Having to leave my wonderful comfy bed…the warmness of my duvet…the knowledge that I don’t have to do anything but … then the alarm goes off and Yes, it is actually Monday. I jump out of bed clap my hands together and sing. That actually doesn’t happen, instead I get in the shower, wash my face, tell myself that I love my job (which I actually do-thank GOD for me) and head off to work. However, the best part of Monday is eating a wonderful dinner like I did tonight. Yesterday JJ and I decided that we would have breakfast for dinner, so Bacon & Eggs Monday was born! 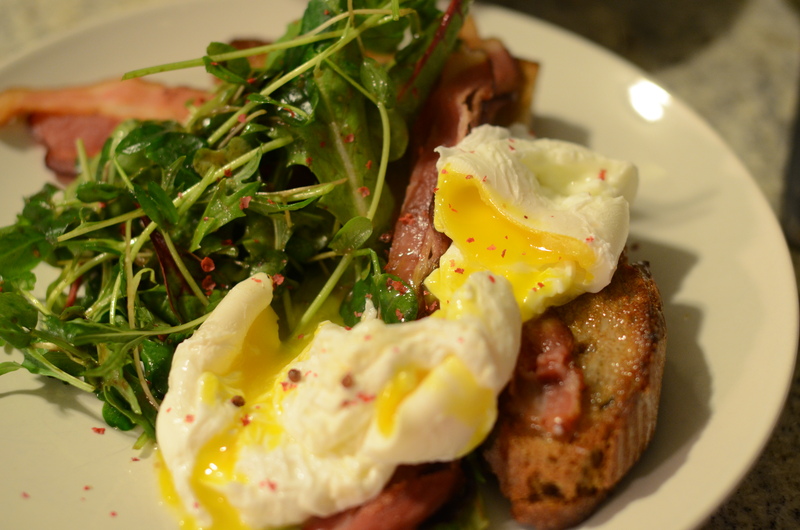 If you are like me, you love poached eggs! I love eating them, I love making them, I love taking pictures of them…it’s just love all around. 1) Fill a pot with water about 2 inches deep. Add 2 Tbsp of white vinegar and bring to a boil. I like to crack my eggs into individual cups and add them one at a time to water…you can also crack them directly in if you like. The water should be at a rolling boil. 2) Once eggs are in the water take a wooden spoon and gently push the egg whites towards the centre. 3) Cook eggs for the desired time, I like mine with the eggs yokes soft, this takes about 3 min. Poaching eggs is an art, if you follow the simple directions of adding vinegar and cooking eggs at a rolling boil in time you to can become an Poaching Eggs QUEEN like me!